After seventy years of propaganda our brains have been instilled with the notion that one must fear private property and avoid hired labour as though they were the work of the devil: that represents a major victory of ideology over our human essence. The citizens of these previously socialist societies often do not understand the importance of even the basic institutions of market economies, such as private property and contract law, or how market friendly reforms can benefit them. Their prejudices against the “market” and their ignorance of how it functions makes them more susceptible to manipulation by political demagogues. 2 This is the basic thesis in Sanguinetty (1995), who argues that decades of socialism in Cuba have hardened anti-market attitudes and led to great ignorance as to how markets function. The author views such biases and attitudes as a significant obstacle to successful market reform in current transition economies and in a future Cuba. Successful economic reform in Cuba, he further argues, should be accompanied by a campaign of public economic education. Our ultimate aim is to gauge the impact that decades of socialism in Cuba may have had on the entrepreneurial skills of its population. This paper is a first step in achieving that aim. The work presented here is very preliminary and it is primarily descriptive and exploratory in nature. We approach the problem indirectly by looking at the self-employment rate of Cuban immigrants to the United States. We view self-employment as being related to entrepreneurial skill, and we will look to see if the likelihood that a Cuban immigrant is self-employed is negatively related to the amount of time the immigrant spent in Cuba after 1959. The main advantage to studying this group is that it allows us to abstract from the effect of a regulatory environment hostile to enterprise— a problem that would be encountered by any study looking at entrepreneurship in a socialist or a transition economy. The main drawback is that the process of emigration is likely to select people in a way that is not independent of their entrepreneurial skills. In the next section we describe the data and discuss briefly some of the relationships it suggests. Then we perform some descriptive estimation. We conclude with a brief summary and some thoughts on future work. Our data are taken from the Public Use Microdata Samples of the 1980 and 1990 U.S. Census of Population and Housing. In keeping with the preliminary nature of this work, we restricted our sample to men residing in the state of Florida. To be included in our sample a man had to be of Cuban origin, and be between the ages of 16 and 65. He had to be employed, not in the military, and could not be a student. We also excluded any man reporting non-zero farming income or farming as his occupation. 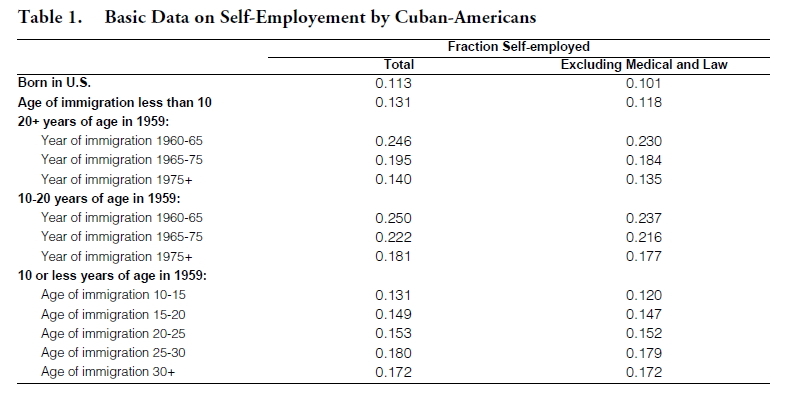 Table 1 presents some basic data on self-employment for various groups of Cuban-Americans. Column 2 provides total self-employment rates, which includes both incorporated and non-incorporated businesses. Column 3 excludes medical professionals and lawyers, two occupations with high rates of self-employment. We have divided the sample into mutually exclusive, but not exhaustive, groups, representing different levels of exposure to life under socialism. In going from top to bottom the groups roughly increase in exposure to life in post-1959 Cuba. Time in the United States is an observable characteristic, and we are able to control for it. This is done in Table 2, where each group is further divided according to potential U.S. work experience. Potential U.S. work experience is defined as age minus the largest of the following: age of immigration, years of education plus six, or 16. 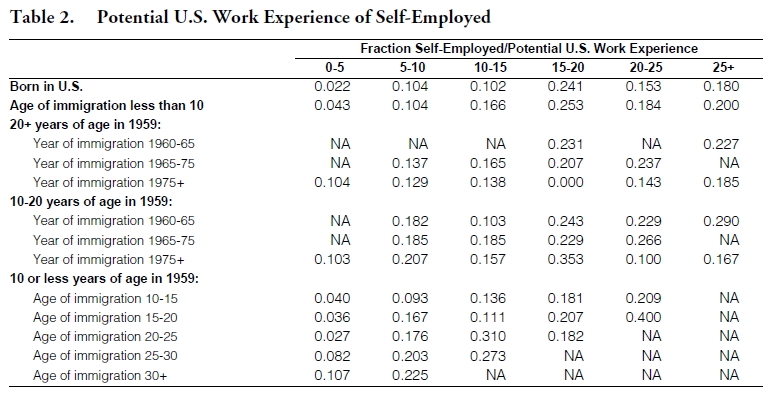 As expected, self-employment rates tend to rise with potential U.S. work experience, especially in the earlier years. 8 Table 2 also suggests that age may have an independent effect. In the first column, corresponding to 0-5 years of potential work experience, the highest self-employment rates are among groups that would tend to have higher average ages. Returning to Table 1 and looking across all groups we see a pattern which is not supportive of the hypothesis that life under socialism reduces the likelihood of being self-employed. All immigrant groups have higher rates of self-employment than CubanAmericans born in the United States. Among immigrants, those with the least exposure to socialism, i.e.,those who migrated under the age of ten, have the lowest self-employment rates. Of course, the groups in Table 1 differ more than in just exposure to socialism. The various groups differ in terms of several observable variables such as education, English proficiency, and age, that may contribute to the group patterns observed in Table 1. Table 3 shows group means for potential U.S. work experience, age, education and English proficiency, variables that likely to be associated with self-employment. As can be seen, those born in the United States tend to have low potential work experience and tend to be younger, both of which would lead that group to have lower self-employment rates. They also tend to have higher education and speak English well, characteristics we will see below are negatively related to selfemployment. Two other groups which also had low self-employment rates in Table 1— those who immigrated under the age of 10 and those who were less than 10 in 1959 and immigrated between the ages 10 and 15— have similar average values to those of the U.S. born. In the next section we will see to what extent these variables account for the observed differences in self-employment rates. Besides differences in observable characteristics, men in our sample also differ in unobservable characteristics that affect of self-employment rates. 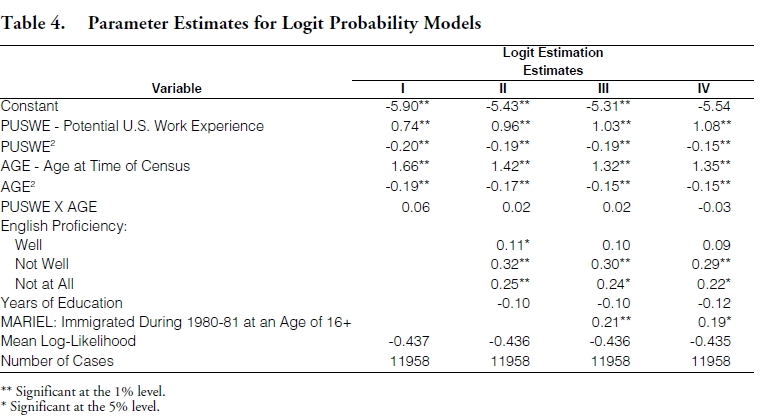 If those unobservable characteristics are correlated with observable ones, they will bias our estimates of the effect of the latter on self-employment. We suspect that the process of emigration from Cuba selects people who tend to have high entrepreneurial skills. This can happen for at least two reasons. First of all, entrepreneurs and would-be entrepreneurs would have been among those who had the most to lose from confiscation of assets and from loss of livelihood, especially in the early stages of the revolution. 9 If entrepreneurial skills are transferable, or if early immigrants managed to take out some of their assets, they would have a higher likelihood of being self-employed in the United States. It also seems possible, even probable, that entrepreneurial skills are positively correlated with characteristics, such as willingness to take risks, that are associated with immigrants. The hypothesis that emigration from Cuba has tended to select out persons with higher than average entrepreneurial skills is consistent with the difference observed in Table 1 between immigrants and the U.S. born, and it also accounts for some of the patterns among the immigrant groups. Consider first those who were more than 10 years old in 1959. Their self-employment rates are lower the later is the period of their immigration, which is consistent with the most entrepreneurial leaving first. For those who were less than 10 years of age in 1959 we find that self-employment rates rise with age of immigration. This paradoxical pattern is also consistent with the process of emigration selecting those with better entrepreneurial skills. The younger immigrants left Cuba because their parents did. Whatever the selection process, it was operating on their parents, and not on them. In any case, the selection by unobservable characteristics that the process of immigration introduces into the data is a problem which must be kept in mind. It is also one which may not be surmountable. We refer to the estimation we report on in this section as being “descriptive” because we do not wish at this point to make claims to having identified chains of causation. 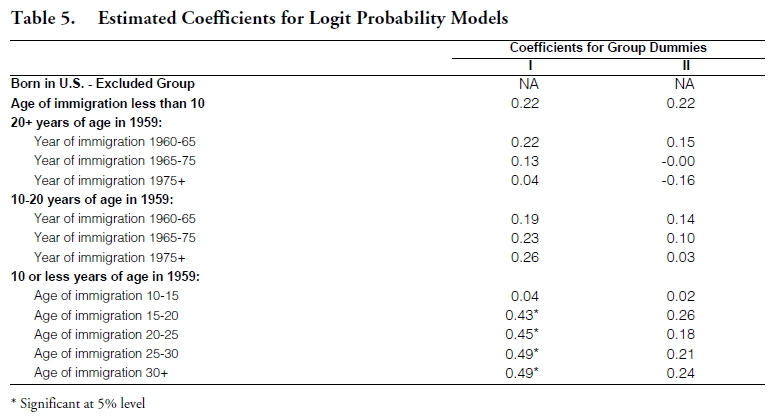 In Table 4 we present parameter estimates for some logit probability models. The logit was used for its simplicity of estimation, though it may not be the best functional form for the problem at hand. Column I gives the estimates for the set of basic variables: potential U.S. work experience, age, their squares, and an interaction term. 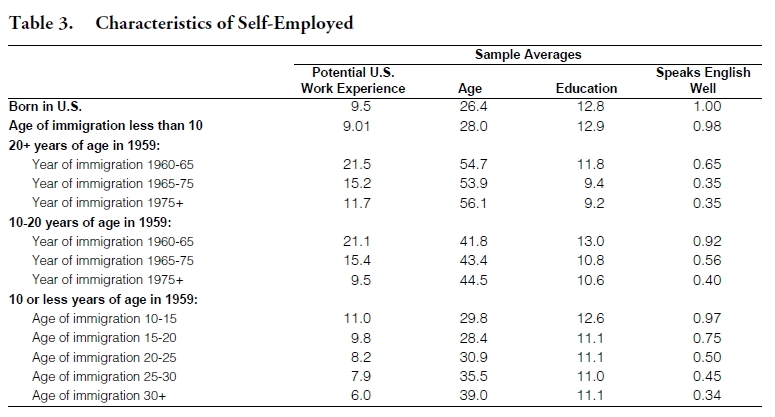 As expected the probability of self-employment rises with potential U.S. work experience and with age, but at a decreasing rate. 10 Except for the interaction term, al the other coefficients of the basic variables are significant at the 1% level. These general features remain the same when other variables are included in columns II-IV. Column II expands the set of variables to include English proficiency and education. Those who speak only English or speak it very well make up the excluded English proficiency category. Interestingly, the lower English proficiency categories are associated with higher rates of self-employment. The estimated coefficients do not change much when other variables are included, though the significance levels fall. Education is also negatively related to self-employment, though its coefficient is not significant at conventional levels (it would be significant at 10%). Tabulations not shown here suggest that the relation-ship between education and self-employment may be more complicated, and may be different for the various groups. Florida, of a large number of individuals over a very short period of time. Even though there is some evidence that the Mariel influx did not lower wages in South Florida, there is the possibility that labor market pressures may have induced an unusually high number to enter self-employment. This our justification for including the variable MARIEL. Its coefficient is indeed positive and significant in the two logits in which it was included. Finally, column IV adds to the variables in column III a set of dummy variables representing the groups in Tables 1-3. The estimated coefficients for the group dummies appear in Table 5. Besides the group dummies, the logit for column I of that table includes the basic variables (as in column I of Table 5). Column II includes English proficiency, education, and MARIEL, in addition to the basic variables. In both columns of Table 5 the estimated coefficients measure effects relative to the excluded group, the one composed of those born in the United States. To obtain the relative effect between any two groups, one has to take the difference of the coefficients of the respective groups. To get a feel for what the magnitudes of these coefficients means, consider the following numerical example. If the probability of a U.S. born Cuban-American is 0.10, then an identical man from another group with coefficient 0.20 would have a predicted probability of self-employment of about 0.119. If the group coefficient had been 0.50, the predicted probability for the immigrant would be about 0.154. Most coefficients in both columns are positive, implying higher self-employment rates, but only four in column I are significant at conventional levels. The coefficients in column II are lower than their corresponding value in column I, and none are significantly different from zero. The differences across the two columns appears primarily to be the result of the inclusion of the variable MARIEL in column II (see column IV of Table 4). The raw data presented in table 1 did not offer strong support for the notion that the entrepreneurial skills of Cuban-Americans as measured by self-employment rates was adversely affected by exposure to socialism in Cuba. Even after controlling for some variables that we would expect to be important, immigrants still tend to have higher self-employment rates. Most problematic are the groups whose members were less than 10 years old in 1959. Not only do they tend to have the highest self-employment rates after other variables are controlled for (Table 5), but within those groups there seems to be no tendency for self-employment to decline with length of time in Cuba. The most that can be said in support of the original hypothesis is that when the Mariel influx is controlled for, (1) the group effects are statistically insignificant, and (2) for those over 10 years of age in 1959, the relative sizes of the group effects falls with length of time in Cuba. Our preliminary findings are consistent with emigration from Cuba selecting out those with greater entrepreneurial skill. The biases such selection implies could, in principle, distort our estimates considerably. In some cases it may mask the effect we were looking for. In others it may create a pattern that can be mistaken for time in socialist Cuba leading to a decline in self-employment in the United States. We do not know whether we will eventually be able to correct for this sample selection bias. The problem is difficult because we have data only on those who migrated to the United States. In any case, the necessary next step is to develop an explicit model of the decision to become self-employed in the United States and to emigrate from Cuba. Such a model will have to show how entrepreneurial ability develops over the life cycle, and how it interacts with labor market conditions in the United States and Cuba, as well as with the emigration process. A more complicated choice process, perhaps involving income determination, may be considered. One final note on the two hypotheses of entrepreneurial skills deteriorating under socialism, and the most entrepreneurial emigrating from socialist Cuba. Both result in a reduction the in entrepreneurial skills of the population remaining on the Island. For some purposes it may not be crucial to distinguish between the two causes, but simply to measure the combined effect. Borjas, George J., “The Economics of Immigration,” The Journal of Economic Literature (December 1994) 1667-1717. Sanguinetty, Jorge, “Economic Education for a Market Economy: The Cuban Case,” in Cuba in Transition— Volume 5. Washington: Association for the Study of the Cuban Economy, 1995. Shiller, Robert J., Boycko, Maxim, and Korobov, Vladimir, “Popular Attitudes Toward Free Markets: The Soviet Union and the United States Compared,” The American Economic Review (June 1991) 385-400. Shogren, Elizabeth, “Yeltsin’s Opponent Proposes Return to Soviet-Style Economy,” The Miami Herald (May 29, 1996). Solzhenitsyn, Alexander, Rebuilding Russia. London: Harvill, 1991.